You may have seen Emily & Em's pictures from their trips to the N.C. State Fair. Neither was exaggerating when they blogged about how much fun the fair can be. And since we live, oh, less than 5 miles from the fairgrounds, there was no way we were going to miss it. We didn't have any fried twinkies or fried mac & cheese, but we did have a blast. September and October have been busy swap months for me, with several swaps all going on at once and multiple projects in varying stages of completion. 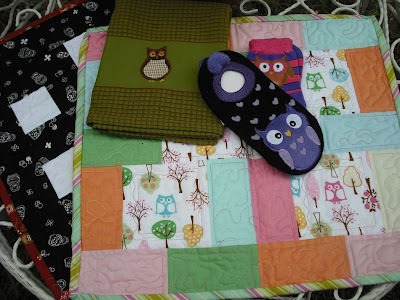 In September, I participated once again in the 6-12" Mini Quilt Swap. The theme for the month was "Owls & Mushrooms", and we could choose whichever we wanted to interpret. My problem was that I couldn't decide between the two. Luckily, neither could my partner, Beth (from Maddie and Me), so we jointly decided to swap one of each! 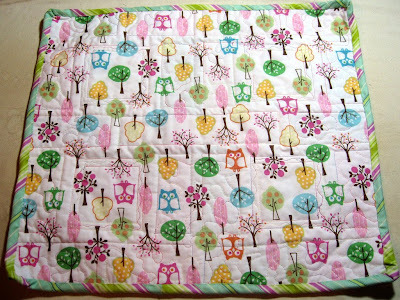 First up, here's the owl quilt I sent to Beth. I took the kids to a sing-a-long at Pottery Barn Kids and, lo and behold, there was an entire bed made up in owl-themed bedding. After deciding that I'd have to re-mortgage my house to outfit the twins' beds, I just picked up a single pillowcase to use in my quilt. I had never used non-quilting fabric before, but the sheet fabric was pretty easy to work with. And, as an added bonus, I realized when I got home that the colors were a near-perfect match with the new Amy Butler quilting solids. 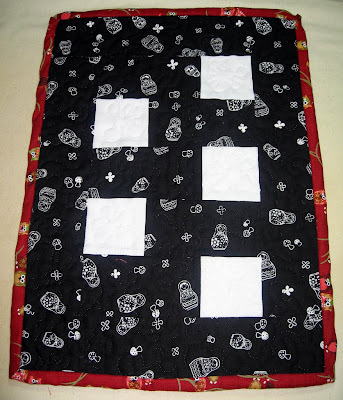 Since I knew I would be doing two quilts, I kept the pattern fairly simple. I also decided that September was the month to get over my fear of free motion quilting. So, after deciding on a spool of variegated thread (another first for me! ), I dropped the feed dogs and went to town. Not too shabby for a first-timer, eh? 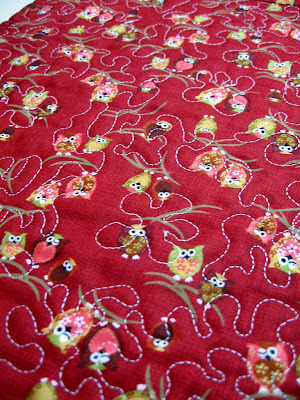 For the second quilt, I found this great matryoshka-and-mushroom fabric on sale at Superbuzzy. I stuck with a basic black-and-white top but added some cool red owl fabric (also from Superbuzzy) on the back and binding. I also free-motion quilted this one, with black thread on the top and white thread in my bobbin. Then I used white thread to quilt little flower shaped in the white squares. Together with some owl-themed goodies, the package was on its way to Texas! (This next picture is Beth's from her Flickr photostream, since I didn't take a picture of all of the goods before shipping it off). Isn't this such a great little package to receive? The three little Scotties were quickly claimed by my kids, and I had to remove them from the kids' beds (where they've been sleeping every night since receiving the package) to take this picture! Great colors, wonderful craftsmanship on the quilting and binding, and some really cute fabric to boot. Some really great raw-edge applique on the sun and mushrooms. Kind of reminds me of a little Smurf house! Both of these quilts are super-soft and will be treasured. 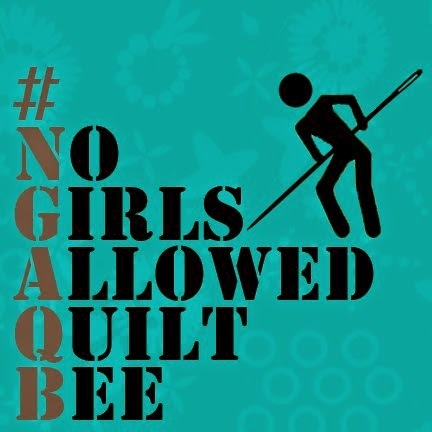 The 6-12" Mini Quilt Swap theme was "Out of the Box", which meant that you could make whatever you wanted as long as it wasn't the traditional square- or rectangle-shaped quilt. And over at Swap 'Til You Drop, October meant Halloween-themed quilts for all. You may remember the beauty I received from Carol as part of this swap. These were way outside of the box for me and different than anything I've done before. I used fusible interfacing to create and attach the shapes and some fancy machine stitches around them for detail. Then I free-motion quilted in the black space. Neither is perfect, but I was fairly pleased with how my idea was executed. A fabric wreath! Isn't it great? And very season-appropriate, too. My wife quickly snatched it and hung it up in the kitchen. Tanaya also sent some fabric, ribbon, and chocolate ... although some of the chocolate seems to have disappeared between the box being opened and the picture being taken! As always, I am awed by the creativity, craftsmanship, and generosity of online swappers. Big thanks to my partners, all of the hostesses, and everyone that puts so much thought, time and effort into their creations for relative strangers and keeps these swaps as strong and as special as they are. I've got a few more swaps quilts still in process (ALQS2, Holiday Booty Swap, and DQS5), which should keep me busy through Thanksgiving ... then I think I'll take a short swap hiatus to focus on my family for the holidays. I made vague reference to a weekend trip that I took up to New York City a few posts ago. My mom lives in Brooklyn and, several months ago, decided to sign up for a table at a local craft show. My mom and her sisters knit the most beautiful sweaters for babies and toddlers and have toyed with the idea of selling them. I guess you could call this a trial run. Anyway, when I went home for what was supposed to be a relaxing weekend, she was getting nervous about not having enough stuff to sell and asked if we could supplement the sweaters with some sewn goods. Well, the weekend (and the weeks since) turned into a whirlwind of activity as we've tried to make some stuff for the table. And have I mentioned that the craft show is this Sunday?! Why am I only just now discovering the Chocolate Lollipop line? I love it! The cut made the directional fabric difficult to work with, but I think it's still cute. Just stand on your head and you'll get the idea! Hard to tell, but 30's reproduction kitty cats playing musical instruments on the left. Anna Griffin on the right. 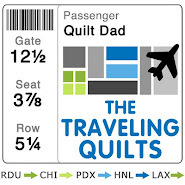 Next, some quilted pillows. They will have pillow forms in them, but since the forms are up in NY, I didn't have any pillow forms to take the pictures. And I even learned how to do envelope backs! Made from some fat quarter bundles that my mom picked up at Purl Soho (her local shop, can you believe it?). I would never think to put these fabrics together, but they seem to work. Boy, they're good. My first time using muslin (above). It was really soft and nice to work with, and I loved the natural color. I'll be using it again. 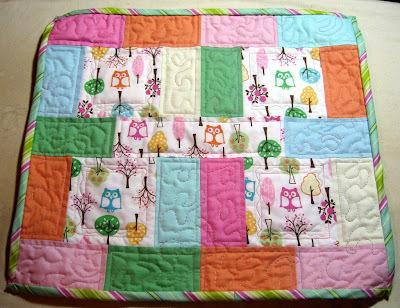 Here's a gender neutral baby quilt with an incredibly soft flannel back. In the interest of time, this one was "birthed" rather than assembled, and will be tied instead of quilted. And finally, some last-minute customized Moleskine books with scraps from my stash. 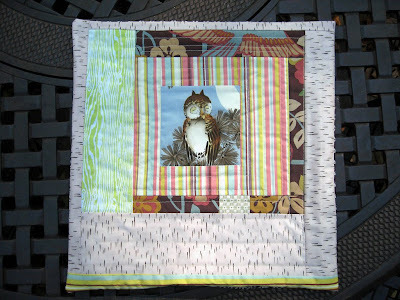 This idea is from the Last-Minute Patchwork + Quilted Gifts book. I value all of your opinions ... please tell me what you think!